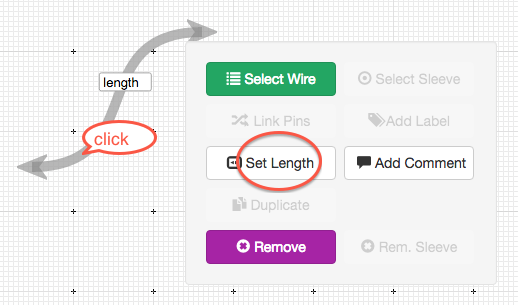 On the main page, click on a path, and select Set Length. Enter the length on your keyboard or using the onscreen keyboard. 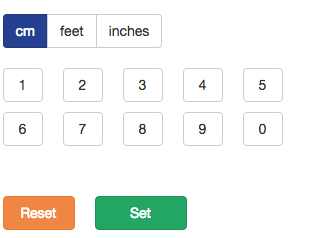 Measurement units can be selected: metric with centimeters or imperial feet. For editing feet or inches, the feet or inches button must be selected before editing. The Reset button removes the length value. "Tip to Tip" means the length of the path measured from the tips of the connectors. The option "Back of Backshell" takes the measurement from the rear of the backshell. These two options are set always for the whole assembly. Changing the measurement type adjusts the lengths for the whole assembly. To help to understand both options, the measured area is highlighted for each option. If the cables are going to be bundled together, the lengths of the bundled part and the parts outside the bundle originate from their previous values, e.g. divided by three or two, depending of the bundle type. Approximately the bundle length is taken from the shorter cable divided by three or two. Changing the main cable length never affect the split section length. Important rule: all the values shown in the path (also in bundling and unterminated) are always added. In the above example the total length of the cable is 100 cm.